With a small dimension of 83 x 64.5 cm (32 3/4 x 25 3/8 in.) this oil on canvas is nowadays hung on theGemäldegalerie, in Dresden. It was painted by the Dutch master Johannes Vermeer circa 1657 and it marks the beginning of his mature period. As can be seen, it depicts a young woman reading a letter in the corner of a relatively large room. The corner is lit by an open window on the left side, as many of Vermeer’s paintings. It is said that the painter was influenced by his contemporary Pieter de Hooch, though the latter placed his figures on the foreground rather than on the background. The photographic precision present in this painting, as well as in others, has suggested that Vermeer made use of a camera obscura to work on his works. This device help him to create images that seem a frozen reality to the audience -the human beings depicted look like dissected or stuff people still in time, preserved for our observation. Johannes Vermeer has often been regarded, together with Rembrant, as a master of light. This always enters obliquely through a window. The light falls on the objects that first catch our eyes: the girl, the letter, fruits and curtain – giving them a sense of stillness. The audience would like to escape the room, breath some fresh air and look to the street. It acts as a symbol of escape; will she climb down the wall and meet that who wrote the letter? It is on that window through which light enters that we can see the reflection of the girl’s face. “X-ray images show that the head of the young girl was originally positioned slightly in front and below its present place. In the original profile, the head was turned slightly away from the viewer. 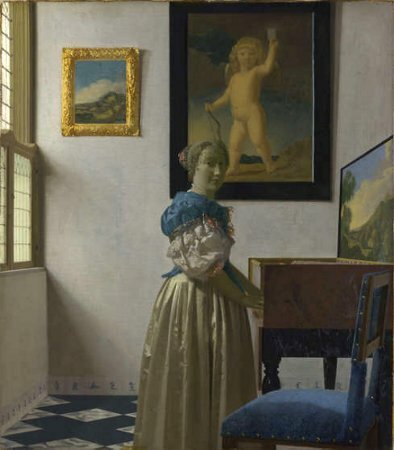 That position accounts for the comparatively full-faced reflection we now see in the window.” On the profile of the girl, it can be said that it matches with that of the woman on Woman in Blue Reading a Letter, being it the one of Vermeer’s wife. The fruit bowl on the front, which shows apples and peaches, is similar (probably inspired by) to that in De Bergh’s Still Life with Fruit in a Wan-Li Bowland a Roemer. A study has discovered that Vermeer also placed a roemer to the right of the bowl but that it was lately painted out in favour of the green curtain. Apples and peaches could underlie the meaning of a love affair. Finally, it is quite important to know that there was once a painting of Cupid on the background wall “just above and to the right of the young woman”. The painting would clearly suggest to the audience that the letter was of amorous nature. Sadly, it was painted out by the painter before he finished the work. Moreover, the vanishing point ofthe painting’s perspective would have been a crucial pictoric element in the painting of our analysis. The picture here presents the actual picture depicted in Vermeer’s painting Lady Standing at the Virginal. I would like to finish the article with the presentation I made in class.